Feb 12 By Jen 15 Comments This post may contain affiliate links. 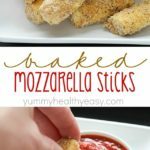 Baked mozzarella sticks for the win! You can’t go wrong with warm, gooey cheese dipped in marinara sauce, am I right?! I took my two younger guys to the grocery store the other day and my youngest sat in the grocery cart seat the entire hour long (if you know him at all, this NEVER happens) and laid his head down and complained about his ear hurting. He’s not a complainer so I knew he had something serious going on. I actually took him into the urgent care that night but they turned me away because they were short a doctor and the wait would be crazy long (aren’t they always crazy long at urgent cares anyway?!) So I gave him Tylenol and he was better that night. He woke up once in the middle of the night and I gave him medicine then too. I brought him to the pediatrician first thing the next day and found out he had a really bad double ear infection. Poor kid! That same night, I was helping my ten year old do some experimenting for his science project (alka seltzer and water, anyone?) while trying to cook dinner at the same time. Always the multi-tasker! My two younger guys were playing on my couches in the living room, jumping from couch to coffee table to couch, when I hear a thud and my youngest son crying – never a good thing to hear. As a mom, you learn the different cries each kid makes. They have a whiny cry, a sad cry, and a hurt cry among others. This cry, was a “I’m really hurt” cry. So I rushed over and sure enough, the HUGEST bump over his eye I’ve ever seen! It grew three sizes in a matter of seconds! If you follow me on Instagram, you know exactly what I’m talking about! I quickly took a picture and sent it to my brother who’s a doctor and he told me to ice it and keep an eye on it. Poor guy with a double ear infection and a huge bump on his eye. Luckily it didn’t break the skin or he would’ve needed stitches! Do you know what helped me get through that night? 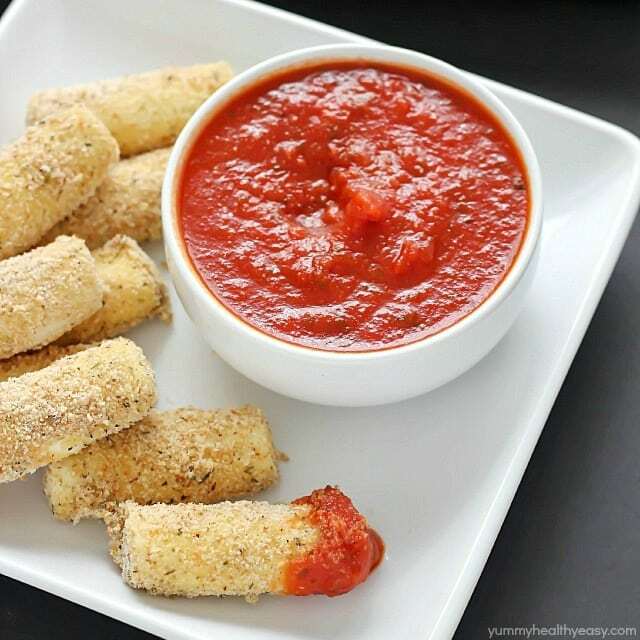 These Baked Mozzarella Sticks. 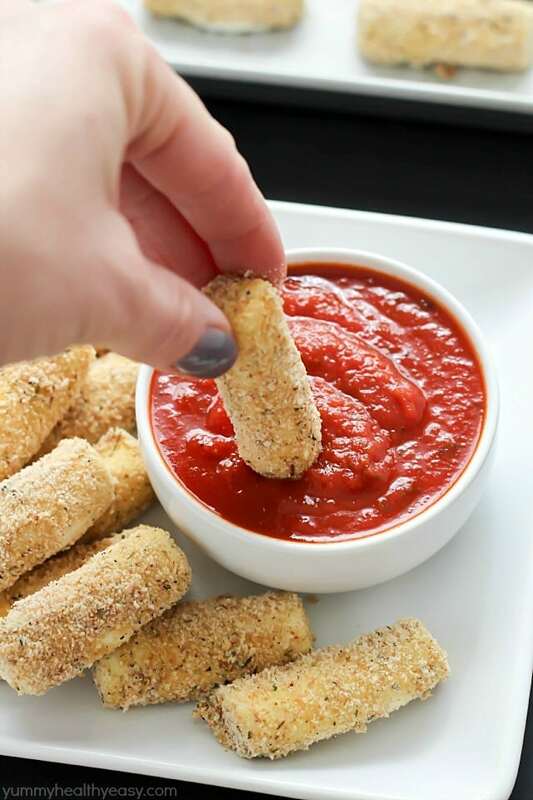 Nothing better than a warm, gooey stick of lightly bread cheese dipped in marinara sauce to get you through a rough day. Or in my case, a rough week. 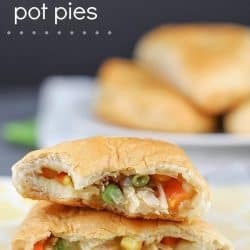 These are also great to serve when you have people over for a quick get together, since they take very little time to prepare. 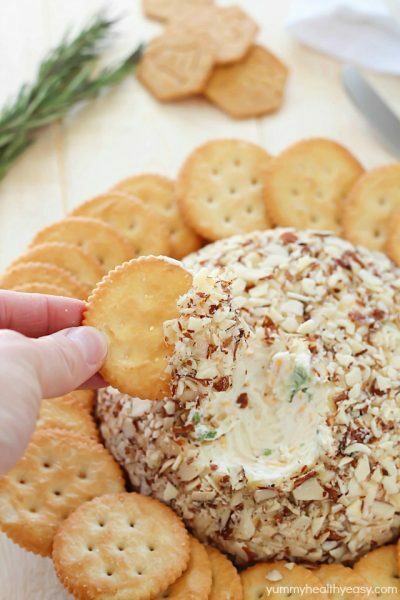 They’re also perfect as a little appetizer for your love fest this weekend if you happen to be cooking for your special someone this Valentine’s. (wink, wink!). Enjoy! 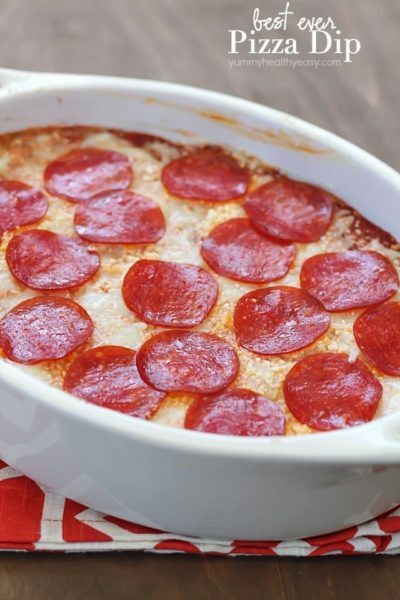 In another medium sized bowl, combine breadcrumbs, Italian seasoning, garlic powder and pepper and stir together. Oh no! I hope little man get to feeling better soon! I can imagine how comforting these mozzarella sticks were after such an eventful day. They look amazing, Jen. Pinning! 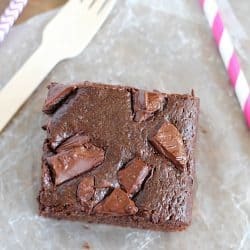 These look and sound fantastic!! I love that you baked them! Hope everyone feels better and stays healthy! We were prone to ear infections as kinds at it was awful. 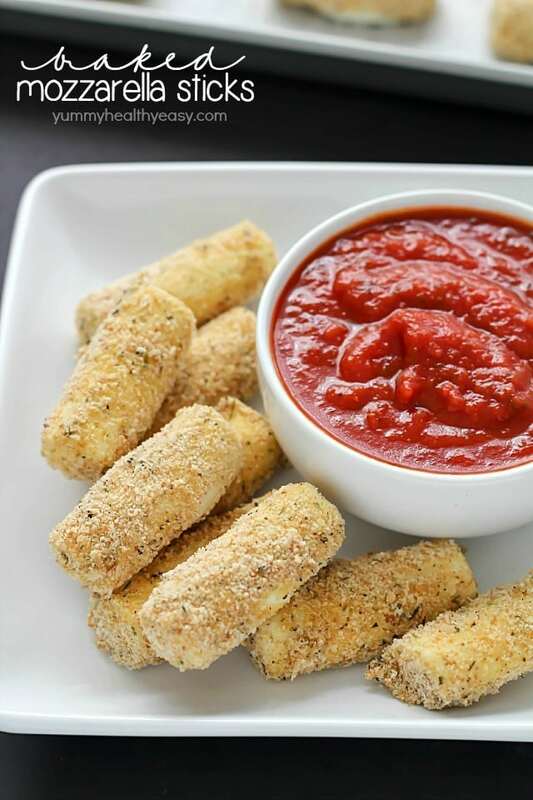 Homemade mozzarella sticks would definitely have cheered us up! 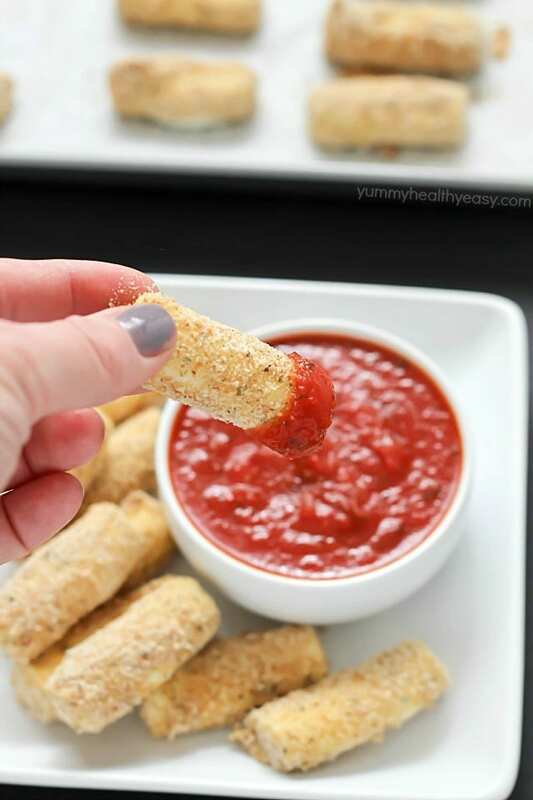 I wish I lived close by because I’d bring you some chocolate to go with these delicious looking mozzarella sticks, Jen! So hoping the end of your week is a lot smoother! Oh no! I am sorry to hear about the colds running through the house! Tis the season! Hope everyone feels better soon. 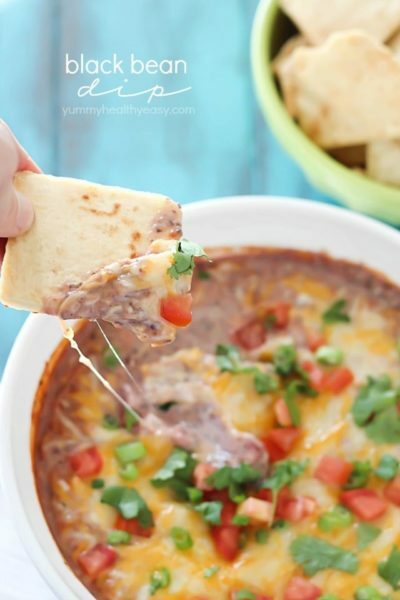 These cheese sticks look so yummy! Pinned! I’m sorry your guys have been sick this week, and a big bump on the head to boot for the little one. 🙁 Hopefully everyone is on the mend again soon! And I’m glad you had these Mozzarella Sticks to perk you up! I need some of these in my life! That “I’m really hurt cry” is one of the scariest moments as a mom. I always hold my breath and hope for the best. Your sick house sounds like mine was a few weeks ago. I’m so sorry you had such a bad week last week. These mozzarella sticks surely helped make it a little better. I want these! 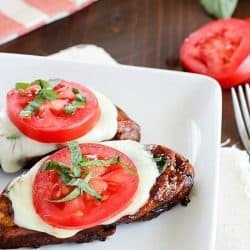 Yummy…I tried these today and they were delicious. But they melted quite a bit. How do you get them to stay together so pretty?? 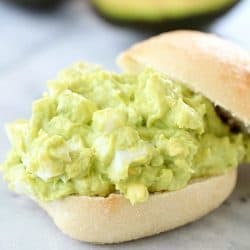 Hi, I’m thinking about bringing these in to an office holiday potluck lunch. Do they reheat in a microwave well? Thanks! 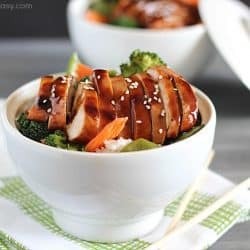 I’ve never tried reheating them in the microwave, so I can’t say for sure but I THINK they would be okay if you don’t cook them too long! Let me know if you try it and how it works out! Thanks!